Have an issue at work? Have questions about your rights as an employee? Contact Young Workers United by texting 415 230 2546 to talk to a worker advocate now! YWU: Raising the standards on the job for retail and restaurant workers since 2002. Excited to announce that we have teamed up with Opus for Work to improve communication with workers in the Bay Area. Text us now we’ve got your back! Board of Supervisors vote to pass Free City College! National Fight for 15 Strike! Workers are rising up across the country in the biggest, most inspiring action yet in the Fight for 15. But here in SF, we’re not just fighting for living wages, we’re defending our right to exist in this city. 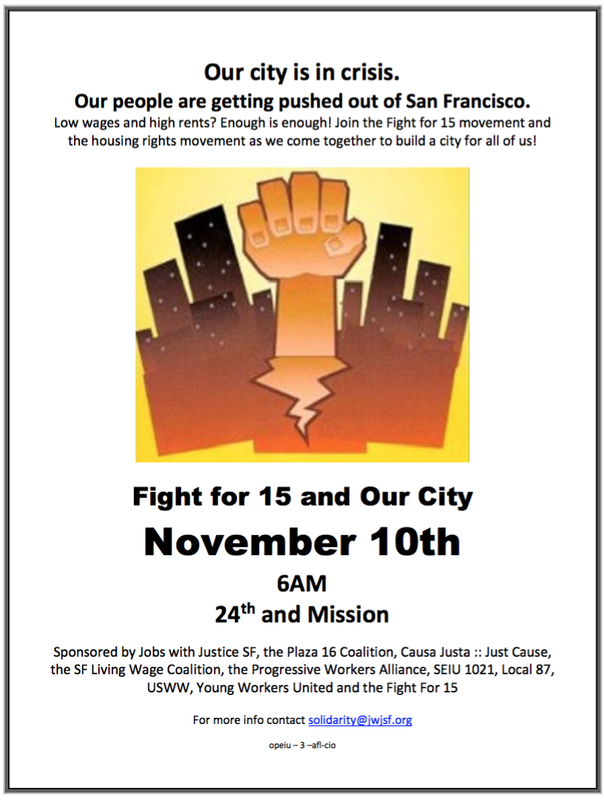 On Nov 10th, the labor movement joins forces with the housing rights movement to Fight for 15 and Our City. We’ll be even more powerful together! The Jobs With Justice San Francisco’s 5th year anniversary celebration is less than 4-weeks away! JWJ has an incredible event planned this year with special guest Angela Davis, inspiring honorees, live music, great food and drinks! Come join us in celebrating the labor community victories and accomplishments! On Saturday Aug 22 2015, the Progressive Workers Alliance (PWA)celebrated 5 years of strategic organizing and collective action! PWA is a coalition made up of Young Workers United, Chinese Progressive Association, Filipino Community Center, Mujeres Unidas y Activas, Day Laborer Program and La Colectiva. PWA has uplifted the voices and issues of immigrant and low-wage workers in various industries throughout the City of San Francisco, and we ask you to join us in celebrating our victories. PWA has taken on campaigns to raise the San Francisco Minimum Wage, pass the California Domestic Workers Bill of Rights, and also end wage theft. 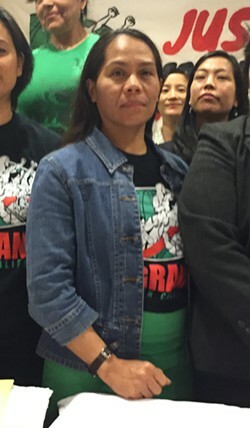 In an era of austerity, corporatization, deportations, gentrification, rising inequality and attacks on organized labor–worker centers and grassroots organizations have continued to organize and build the collective power of low-wage workers across different sectors of work from restaurants, retail, care-homes, day labor and domestic work. As part of celebrating five years as an alliance, PWA was able to host a forum on community-based worker organizing that highlighted the urgent issues that impact low-wage workers and the various strategies that are implemented to fight exploitation. The forum had speakers and workshops that focused on immigrant worker issues, the fight for just wages, the campaign to end wage theft, and racial justice in the workplace. The workers forum concluded with a cultural solidarity night with performances, dancing and food. Right now we are searching for workers who have benefited from the Retail Workers Bill of Rights! If you have, come down to our office or let us come meet with you to collect your story! Need Help Understanding Your Rights? Or Understanding The Retail Worker Bill Of Rights? We can come by to do presentations at your class, organization, club, and sorority / fraternity! 30 minute presentation about working conditions and organizing in the low-wage service sector. 45-1 hour Know Your Rights on the Job training including the basics of organizing and focused on issues of Minimum Wage, Paid Sick Leave and Healthcare Security Ordinance. 45-1 hour on the new Retail Worker Bill of Rights, this new law focuses on chain stores in SF. It targets things like on call shifts, gaining access to full time scheduling and two weeks advanced notice for workers. Call or email us to set up a time! A former domestic worker has filed a lawsuit against her former San Francisco employer who are top tech executives at AirBnB and Uber. Julieta said the couple underpaid her for years and the husband sexually harassed her. Young Workers United will be a having fundraiser on Monday, September 7th. Where: Virgil’s Sea Room (3152 Mission St). We will be asking for a $10-$20 donation at the door. If you aren’t able to attend the event you can make a donation via PayPal or you can sponsor a group of dancers. Email us at youngworkersunited@gmail.com if you are interested in donating to a group of dancers. Doors open at 4:30. From 5-5:30 we will be having salsa lessons, with the salsa-thon starting at 5:30! We will be offering food as well. Come join us for some drinks and dancing! Thank you to those who came out to our fundraiser! We had a great turn out of 54 people and were able to raise $3,283!